Fresco transferred to canvas from the Church of Santa Maria d’Aneu, La Guingueta d’Aneu, Pollars Sobira, Spain. The iconography of the Romanesque frescoes of the Apse of Santa Maria d’Aneu shows the strong intellectualization of Romanesque art, which often waves the narrative in favor of symbolic concepts. 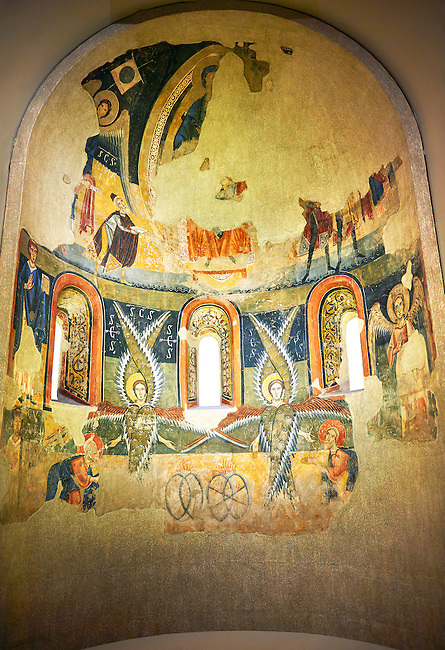 Images of the Old Testament prophecy occupy the central part of the apse: the Seraphim of Isaiah's vision, burning embers that purify the words of Isaiah and of Elijah and four-wheel chariot of fire of Yahweh according to the vision of Ezekiel.